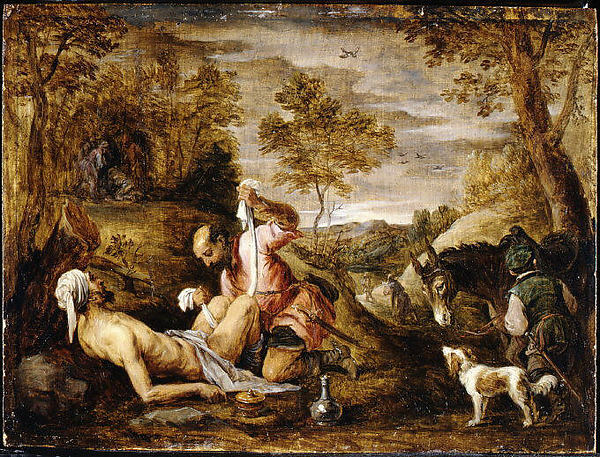 John Drury, DD, in The Parables of the Gospels, explains why it is very doubtful that Jesus ever spoke the parable of the Good Samaritan. The evidence points towards the real author of this parable being the same person who was responsible for the work of Luke-Acts. For convenience we’ll call him as Luke. It is not likely that different traditions, one recalling allegorical parables spoken by Jesus and the other more realistic stories of his, went their own distinct ways so that Matthew heard one sort and Luke the other. I think it’s more reasonable to suggest that we see the creative hands of the authors at work. Another indicator that Luke’s creative imagination was responsible for the parables unique to his gospel is their structure. It is this “middle” part of the story, or the mid-point in time, that is the turning point. Not that this observation is original with Drury. It is a familiar pattern to students of Luke’s parables ever since Conzelmann’s The Theology of Saint Luke. So the story of Jesus begins in a narrative rich in allusions to the patriarchal stories of Genesis and Judges, proceeds to portray Jesus as the new Elijah (contrast Mark and Matthew who gave this role to John the Baptist), and follows up Jesus’ mission with the growth of the church as seen in his parables and in Acts. Jesus is the mid-point or turning point of the grand narrative. This carries over to Luke’s eschatology. In Luke we read less of the end of the age, period, than we do of the end of a person’s life. But that end of the individual’s life is not the end of the story. Consequences of the life led follow. The individual’s end is the turning or mid-point. In the parable of the rich fool, for example, the crisis comes with his unexpected death and this is followed by the punishment he must receive in his afterlife. For Luke the “end” is moved from the cosmic to the individual level. It’s the way Luke thinks and the way he designs narratives. He didn’t just happen to inherit a subset of parables from Jesus that coincidentally matched his own literary-narrative style and no-one else’s. The parables of Jesus in Luke’s gospel are Luke’s own creations. If only by symmetry of pattern, the L parables fit perfectly into Luke’s perception of the historical significance of Jesus’ biography.